Here at Huey HQ we were winding down after a busy show season which had seen us at the four points of the compass. The last event that would require flying a reasonable distance was to be the Scale Model World Show at Telford. However we got an interesting invitation to attend a private event on the tip of Kent. 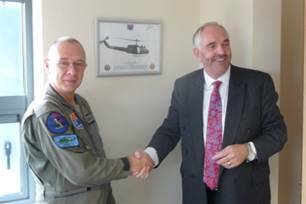 The request came from Gary Slater, Commercial Director at Heli-Charter who are based at Manston in Kent. A former WW2 RAF base and home to an impressive museum dedicated to the Supermarine Spitfire, but I digress. 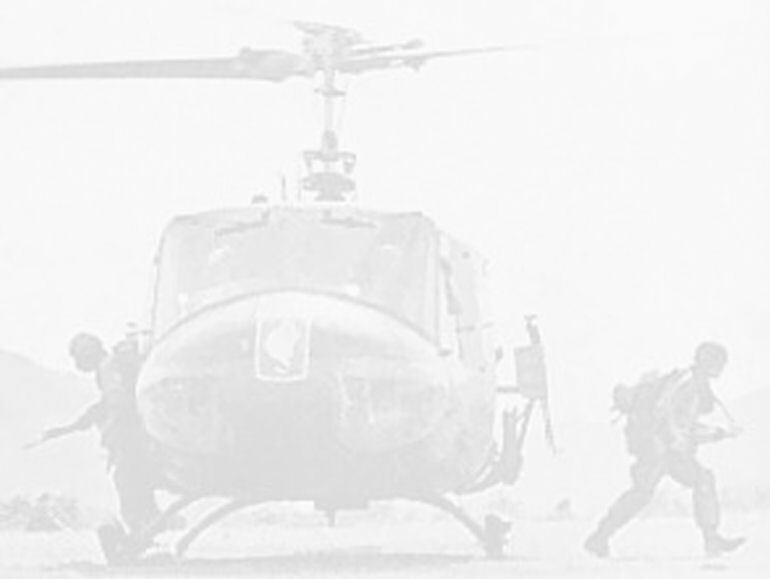 Heli-Charter, as the name implies, charter out helicopters for whatever purpose you require. Along with this they carry out maintenance on aircraft. 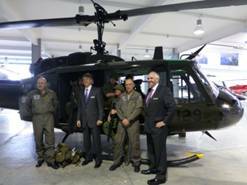 They have just had a new facility built, which was also to house the new string to their bow which is to be the first distributor of new Bell Helicopters in the UK. 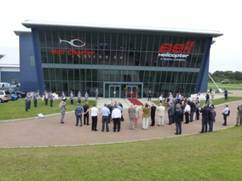 They had organised a Grand Opening and wanted a large selection of Bell manufactured helicopters on display. This is where our invitation came in as they felt that such a grand opening could not be done without the presence of the Bell icon, a Huey. 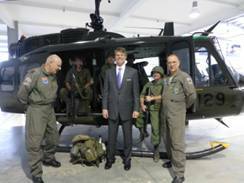 The opening was to be attended by John Garrison, CEO of Bell Helicopters and Danny Maldonado, Executive Vice President of Sales and Marketing, Bell Helicopters Textron Inc. This was too good an event not to be present at, so Phil and Becky liaised with Gary and his team and it was agreed that 509 would fly down on the Friday. The reason for this was two-fold. One was to make sure we got there in good time in case the weather changed and secondly so that the crew would have time to spruce the old girl up in time for the opening on the Saturday. 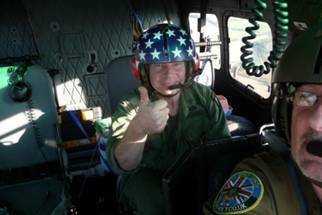 The call went out to see who would be available for this event and the team turned out to be Phil to fly, myself to co-pilot and Mark Howarth to aid and abet us on this sojourn. We also drafted in the help of Patrick, Lee and Steve of the Vietnam re-enactment group that Mark is a part of. They represent the 2/327th Infantry LRRP (Long Range Recce Patrol) ‘No Slack’ (http://www.101st-noslack-327th.co.uk/#/about-the-327th/4525488572). They would drive to Manston from Guildford on the Saturday morning. Phil and I met at the hangar at 0900hrs on Friday morning and immediately set about getting 509 out onto the strip. Phil 'A' checked the machine and we set about loading the ground handling gear into the back. Mark had arrived and we loaded all his gear in the back of the Huey. With a little re-adjustment we took off to Blackpool to refuel. Back to Wesham for final checks on the route, NOTAMS etc. The weather forecast was good with a tail wind. Phil, myself and Mark climbed aboard and readied for the first leg of the journey south. Phil lit the fire and the mighty blades began to spin. Lifting at 1400hrs he nosed over and turned south to take us over Warton airfield. There was no activity so we were given permission to fly straight over their centre line. We picked up the northern end of the low level corridor at Wigan to take us south between the airspace of Manchester and Liverpool Airports. Once clear of the corridor we turned south east to fly down past Stoke and Stone. We transited Tamworth and flew to the north of Coventry Airport. We were soon approaching Sywell Airfield which was our refuelling and half way point of the flight. The weather had indeed been with us as the tail wind had helped us along quite a bit. 509’s tanks replenished we went for a drink and a comfort break. Back out to the Huey and we strapped ourselves back in. This was going to be an interesting leg of the journey as we were going to be transiting some potentially busy airspace. We lifted from Sywell at around 1630hrs and turned south east towards St Neots and Cambridge. We flew south of Cambridge but north and east of Stansted's airspace. Turning south, our aim was for Southend and clearing their centre line as swiftly as possible. All the way down we had been in contact with two ATCs simultaneously leapfrogging as we went. Southend gave us clearance and we passed overhead without any delays. Now we were over the Thames Estuary with Sheerness on our nose. The sun by this time was dropping in the sky which made for interesting light reflected on the water below. 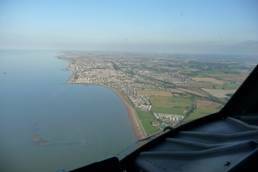 Once over the water we turned east to fly over the Isle of Sheppey and on to Whitstable and continue along the north Kent coast. Passing Herne Bay we knew we were nearly at our destination. Manston ATC gave us permission to enter their perimeter to take a better look at where we were expected to land at Heli-Charter. We spotted people on the ground at the eastern side of the building. There were already aircraft on the ground but we were guided in to land not too far away from the hangar door. We could see cameras videoing, but knew they were going to get blown by 509's downwash which would result in the usual Huey wobble on the video. We touched down a little after 1730hrs much to the delight of us and all those on the ground. After a quick stretch of the legs we set about unloading wheels and 'A' bar so we could get the Huey into the hangar. There were one or two worried faces as they looked at the height of the main shaft and the tail boom. We knew the main mast is 14ft and they knew the door was 14ft 6in, the worry was the aerial on the tail but that could have been removed if need be, but it proved to be unnecessary. A small tractor was attached to the 'A' bar and 509 was pushed inside and manoeuvred into the bay that had been allotted to her. The final shuffling of her into position was done by sheer brute strength of half a dozen of us pushing on the 'A' bar and wheels with Phil turning the helicopter with the tail. Happy she was where they wanted her we removed the ground handling equipment. We emptied the cabin of all the paraphernalia we had taken down with us and set about cleaning her. I got the pot of paint and a brush and went round touching up any chipped paint I found or rivet heads that had lost their coat of paint. Phil WD40'd the tail and Mark polished all the plexiglass. By 2000hrs we were done and got a lift to our hotel for a well earned drink and a welcoming bed. Eight o'clock Saturday morning saw us breakfasted and on our way back to the hangar to put the finishing touches to 509. We also set about doing some research on John Garrison, the President and CEO of Bell so we had an idea who we were going to meet later on. When we got to Heli-Charter the place was a hive of activity. Everyone was making sure the facility was looking its best for the Grand Opening and the guests who would soon be arriving. 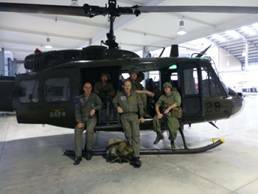 Our guys turned up in good time and proceeded to fill up the back of the Huey. One minute the cabin looks huge, the next it looks very cramped when it has four 'GI's' in the back with all their kit! Helicopters were arriving left right and centre. The word went round that the Bell VIPs had arrived so we were all ushered outside for the official opening speeches and the cutting of the ribbon. Ken Wills owner of Heli-Charter made a short introductory speech before handing over to John Garrison. Mr Garrison spoke eloquently and engagingly about the partnership of Bell Helicopters and Heli-Charter and the amount of hard work that had to be done to get to where they were on this day. He then thanked everyone for being witnesses to this important occasion and he was pleased to see to the Huey and its crew present. Wow, he'd already spotted us and taken note before we had been introduced. The ribbon was duly cut and in everybody went. We went back in through the side door and took up position by the Huey with Mark, Lee, Patrick and Steve in and around the machine. Soon after Mr Garrison was led into the hangar to be confronted by 509. He insisted on coming over and having a look. Phil and I were introduced to him and had a quick chat. He wanted to meet the rest of the crew and have his picture taken by the venerable Huey. Phil and the crew with John Garrison, CEO of Bell Helicopters (left photo) and Ken Wills, CEO of Heli-Charter. 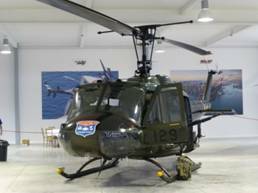 There was a constant flow of people coming to have a look and a chat about the iconic Huey. 509 held her own amongst the glittering array of more modern machines lined up in the hangar. 509 did, however, have competition in the form of a 429 outside that was taking people for quick introductory flights. I don't know how many times it took off and landed but it was certainly kept very busy. One of the most common questions was as per usual, 'what time will you be leaving?'. We're used to it now so never take offence at it. Even John Garrison asked us that one. Shortly after lunch Ken Wills came over to Phil and said that John wanted to meet us and have a chat in private. We left the others in charge and went into one of the offices away from the main hangar. 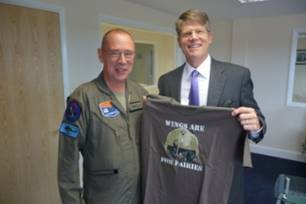 Phil presented him with his favourite t-shirt 'Wings are for Fairies' which brought a laugh and the comment that they have 'dress down Friday' in the offices of Bell. The conversation moved on to explain how Phil had ended up getting 509 and how he finds operating it here in the UK. We were grateful to have had the opportunity to talk to Mr Garrison as we knew he had a busy schedule of meetings whilst at Heli-Charter. At 1400hrs we set about getting 509 ready for departure. Phil had done his full 'A' check in the morning when we arrived, so we only had to pull her out of the hangar and away; never a quick job. The ground wheels were attached and the tractor slowly pulled her out into the bright afternoon sunlight. The wind direction had change through the morning so 509 was positioned on the tarmac to the north of the hangar. We removed the wheels etc and secured it all in the back, along with everything else. The blades walked round, we were ready for departure. We said our goodbyes and climbed in. I remained outside to make the final checks once Phil had started the turbine. All good outside, I climbed in to the front left hand seat out of the turbulent air beneath her beating blades. Phil made contact on the radio with Manston ATC who gave us permission to depart. With that Phil pulled pitch and 509 rose serenely into the sky. Final checks on the controls and we nosed over to the south before turning back on ourselves to head north and to give Heli-Charter another chance to hear 509's very distinctive melody. 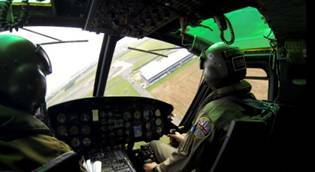 The return flight was to be precisely the reverse of coming down but with the possibility of re-fuelling at Coventry as there was an event on at Sywell and they might not be able to squeeze us in. We made good time to Southend and we were soon talking to Stansted. The weather at this point had taken a turn for the worse - we were still able to make progress but we had to drop our altitude just a little. Turning north east around Stansted’s space we were again shortly in contact with Sywell who said we were able to come in to top up 509's tanks. Whilst we took on some 450 litres of fuel Mark and I sat in the sunshine on the grass and watched a Spitfire take off. The sound of the Merlin was fabulous. We didn't hang about, once re-fuelled we climbed back in and set about departing for Wesham. The flight from Sywell was very relaxed as the skies seemed relatively quiet and the radio chatter was considerably reduced in comparison to the flight down. We even got the chance to listen to some music, Born to be Wild rang in our helmets as we headed home. It was somewhat surreal, listening to Steppenwolf whilst flying in a Huey. As we got further north the weather was turning against us but we managed to skirt around the worst of the weather and touched down safely at Wesham around 1815hrs. We put 509 to bed in the hangar and reflected on the last thirty six hours. There had been a lot of flying and a lot of talking, as per usual, but it had been a really enjoyable and worthwhile trip. Heli-Charter and all their staff could not have been more welcoming, nothing was too much trouble, it was a pleasure to meet everyone. Thank you.